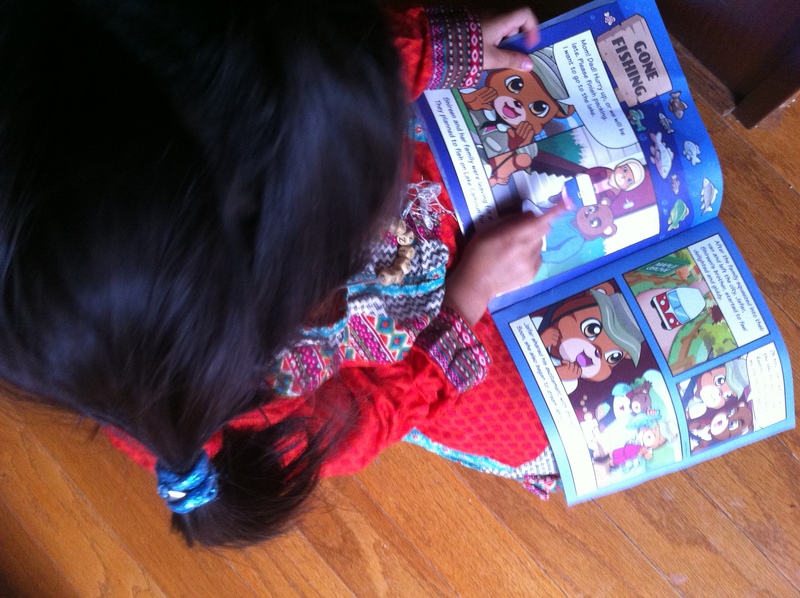 I’m excited to review Noor Kids comic books! How to Get the Books: You basically sign up online here at Noor Kids to receive the comic book bundle in the mail. Z loves getting mail! I ordered a stash a while ago, when Z was 3 last Eid, and loved the concept of these books. About the Authors and Backstory: The stories are based for children growing up in North America. 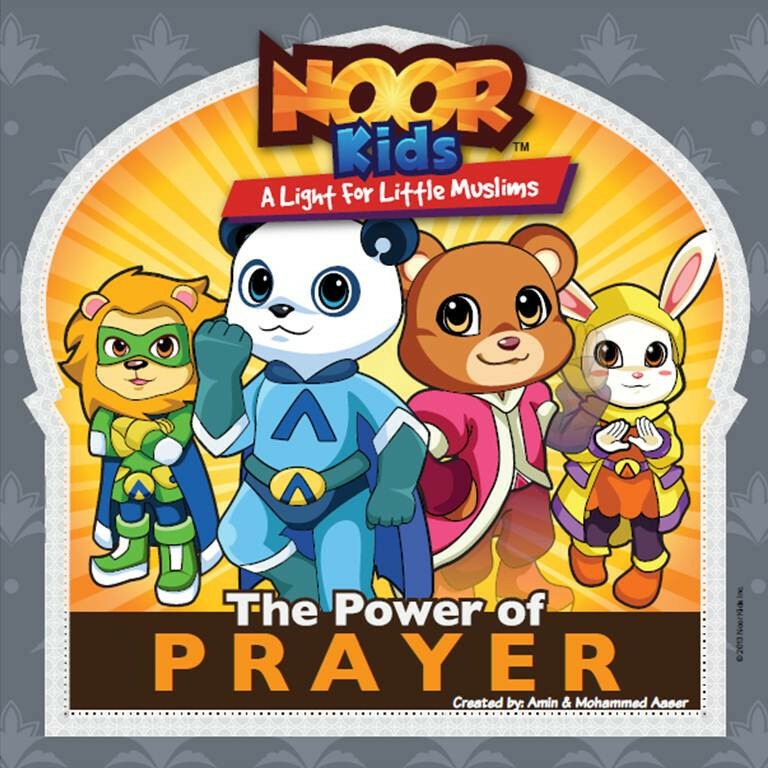 2 brothers Mohammed and Amin Aaser created these comics for children to be proud of their Muslim identity- these books are now entering over 25,000 homes across 25 countries! My thoughts: A nice thing about these books is that they’re light weight around 25 pages, and fit easily in a little backpack. Z had placed these in her backpack when we traveled, and these kept her entertained on the road trip. 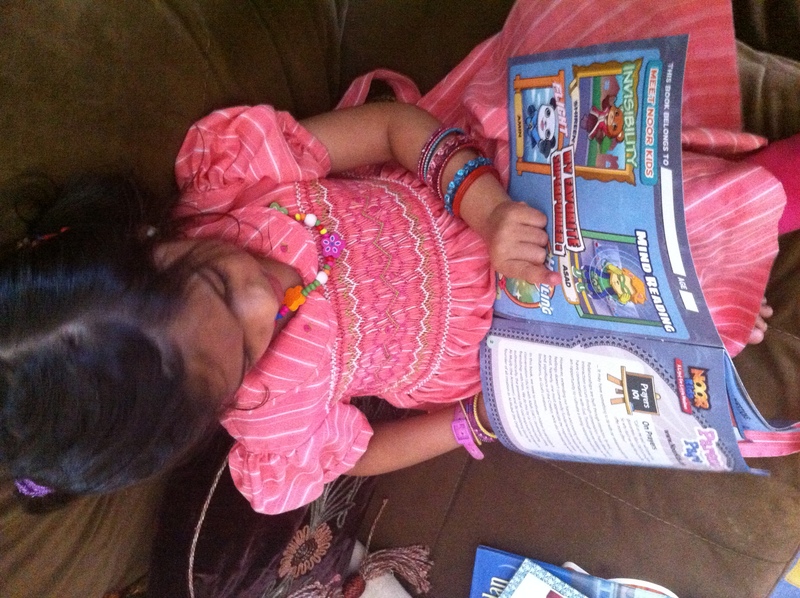 She left them at her grandparents house so Noor Kids sent me a sample for reviewing, and was happy to see Z was excited to see them again, as was I.
Z’s thoughts: The first thing Z said when she rifled through the pages was, “COLORINGGGG!” – a coloring page keeps them busy. I think she enjoys them more at age 4 than at age 3. The illustrations are animated and full of expression. I love the way the female characters wear hijab from time to time and the way their animal ears poke out of their hijabs! Z wanted to know why Shireen (the bear) below was sad, and asked over and over again to which I had to explain over and over again! “Sweet pea, there is no reason to stress at all. Tonight, raise your hands and give Allah (SWT) a call. Everything is possible through Him, no matter how big or small.” – Shireen’s father to Shireen when she still doesn’t catch a fish during a camping vacation. Nice Perk: At the end of the comic books, they feature an Arabic letter and show how the arabic letter looks written in its three forms – the beginning , middle, end. When teaching Sunday School to preschoolers, I noticed that children often get confused when they see the letter broken up, so the good thing about this page is that children get familiar to seeing the letter in 3 different forms. There are also a few Arabic vocab words so that is nice to introduce a little Arabic on a basic level. 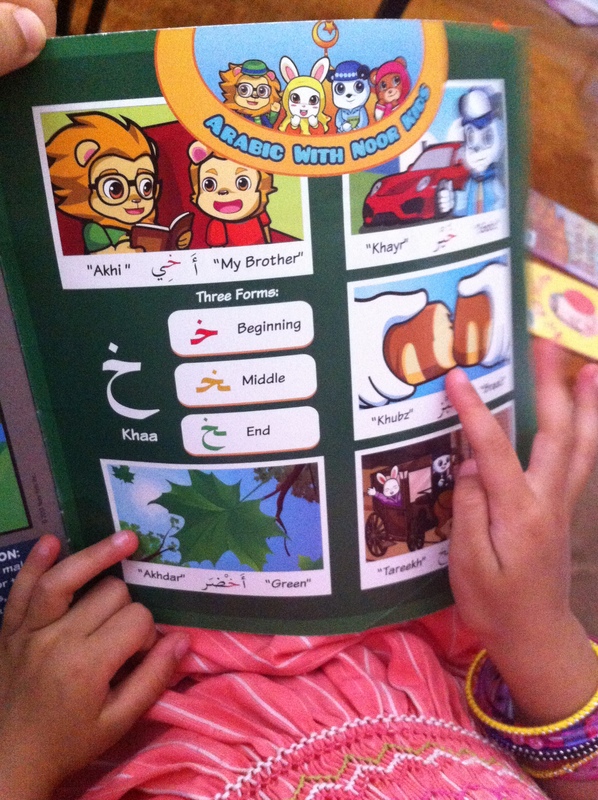 Planning on placing Z in a public school for next year, but I like if she reads these, she will still get a little Arabic! 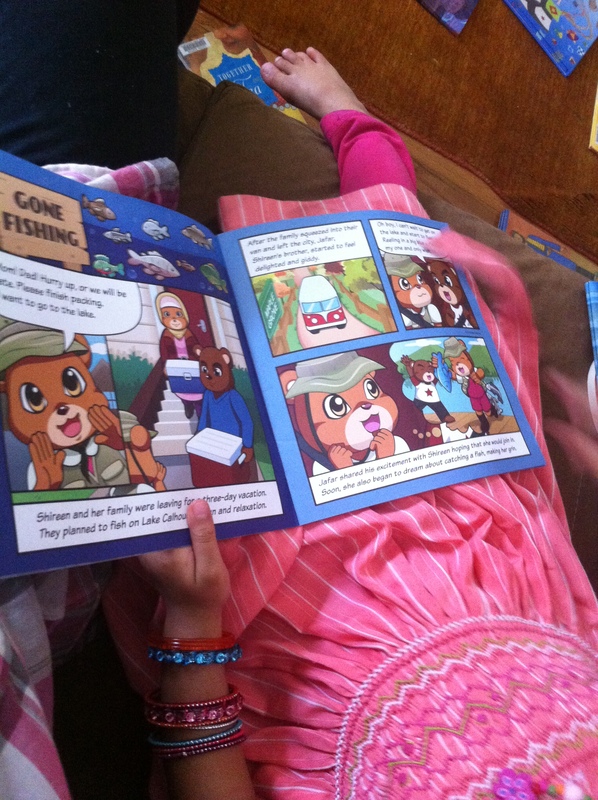 Dua: I loved how this recent edition brought prayer down to a v.young child’s level. The creators of this book, Mohammad and Amin Aaser, have a mother who has cancer and is not feeling well. Please keep her in your prayers. This recent edition (Power of Prayer) was inspired by her. I enjoyed the duas placed in Noor Kids as well; this was paired with the COLORINGGGG page!